Powerful one-step cleaner, disinfectant and stain remover. It eliminates odors caused by bacteria, mold and mildew. With Clorox� Clean-Up� you can clean and disinfect confidently with the power of Clorox� Bleach. This fresh smelling spray cleaner is perfect for use in offices, day care centers, restaurants, schools and other commercial facilities. 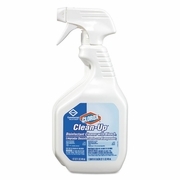 Clean-Up Disinfectant Cleaner with Bleach, 32oz Smart Tube Spray, 9/Carton.